My heart gets happy this time of year when I start to switch over to my fall meal menu. This doesn’t have to mean all stews and chili (we can save some of that for winter, people) but the incorporation of some great fall produce. 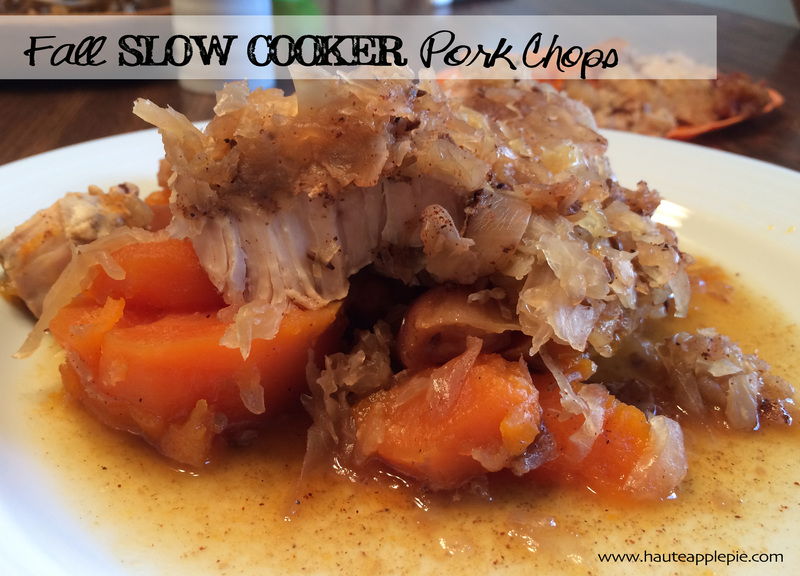 This Fall Slow Cooker Pork Chop recipe is a go-to in my house in the cooler months. It incorporates sweet potatoes, apples, onions and sauerkraut for a deliciously hearty yet healthy fall meal. Just a little peeling and cutting in the morning will give you an earthy evening dinner. In slow cooker, layer sweet potatoes on bottom, followed by apples and onions. Place pork chops on top. Lay sauerkraut over the top. Pour apple cider vinegar. Mix all spices together in a both and sprinkle over the top. Cook on low for 7-8 hours. So simple. So delicious. So fall! Greetings from St. Louis! And no, I am not blogging while on vacation. The rumors are true. I apologize for the lack of posts the past couple of months, but my family and I have been busy packing up and shipping down south to the St. Louis area, we rented a house from Twiddy rentals for three weeks. My husband is taking on a one-year stint down here, so we are another stop on our ‘tour of the midwest’ marriage. We aren’t sure where life will lead us after this but we are ready to explore all things from the heartland and enjoy some warmer temps while we are at it. I’m not ready to give up my cheese and sausage just yet, but am excited to explore the culinary nuances down here on the Mississippi. While I plan to bring you some local delicacies – toasted ravioli anyone? 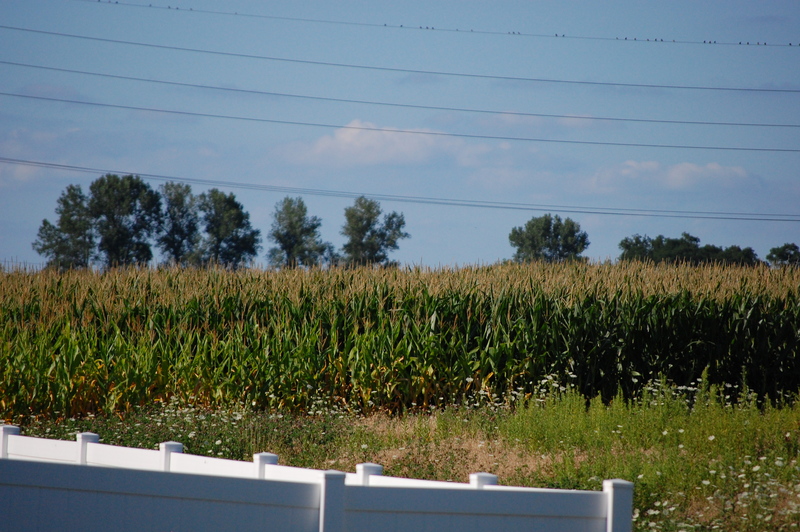 – today I am focusing on corn. We are actually living on the Southern Illinois side of St. Louis. While we are still in a heavily populated area, it is the most “rural” place this city girl/suburbanite has ever lived. Many of you small town, farm folks would probably laugh at me if you saw what I was talking about. 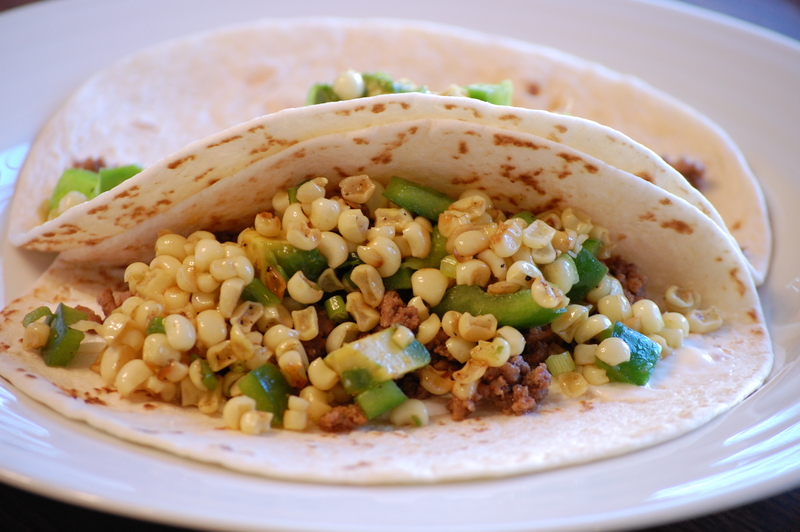 In any case, today, instead if BBQ Pork Steaks or Gooey Butter Cake, I am bringing you a recipe with fresh corn. Why? Because this is what my backyard looks like. No, I didn’t pick this corn from the field, but did buy it local and it is delicious. 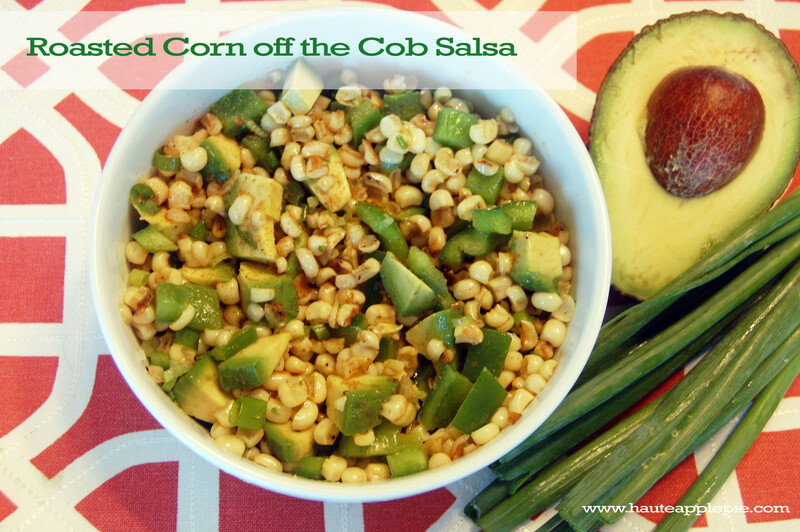 Taking the time to cut a little corn off the cob is well worth the few extra minutes. This Roasted Corn off the Cob Salsa is a great topper for tacos, fish or chicken or is great for dipping or just eating by the spoonful. And with this handy little tip for cutting the corn, life has never been easier. 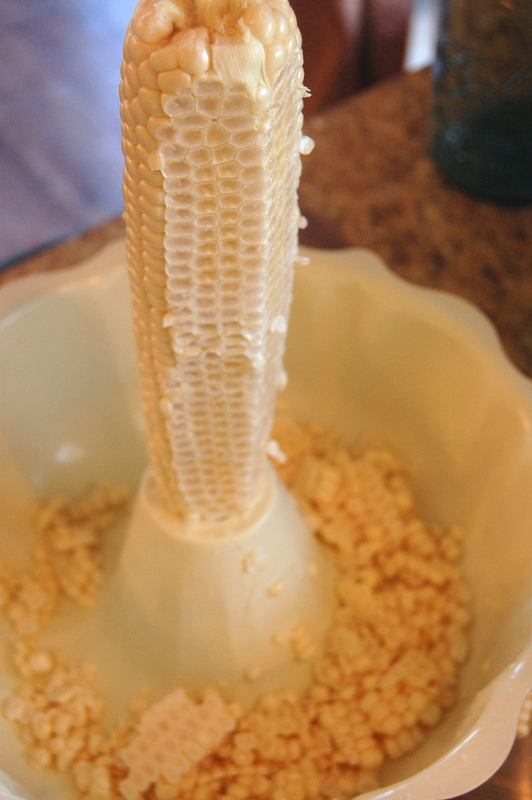 Simply place the ear of corn at the top of a bundt pan and slide downward. The kernels will fall into the pan below, instead of exploding all over your counter! In a cast iron skillet, heat olive oil. Add corn. Spread evenly, sprinkle with cumin and roast for 8-10 minutes, until corn is a nice golden color. Remove from heat and place in bowl. Mix with green pepper, scallions, avocado and add sea salt and pepper to taste. I hope you enjoy and I look forward to bringing you some fresh, new recipes and ideas! It’s March Madness! This time of the year I am always looking for a good appetizer or meal to serve to a large group. 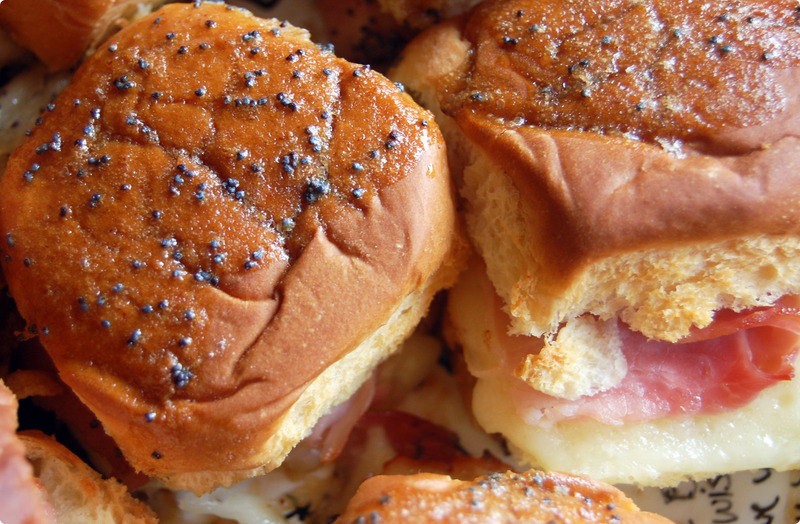 I served these hot ham and swiss sliders during the first round of the tournament. I got the recipe after two entire pans were gobbled down in minutes at a family gathering awhile back. They are delicious and easy to prepare ahead of time so you won’t miss any of your need-to-watch games. The sauce on top creates a sticky, sweet flavor that mixes perfectly with the salty ham and creamy swiss. 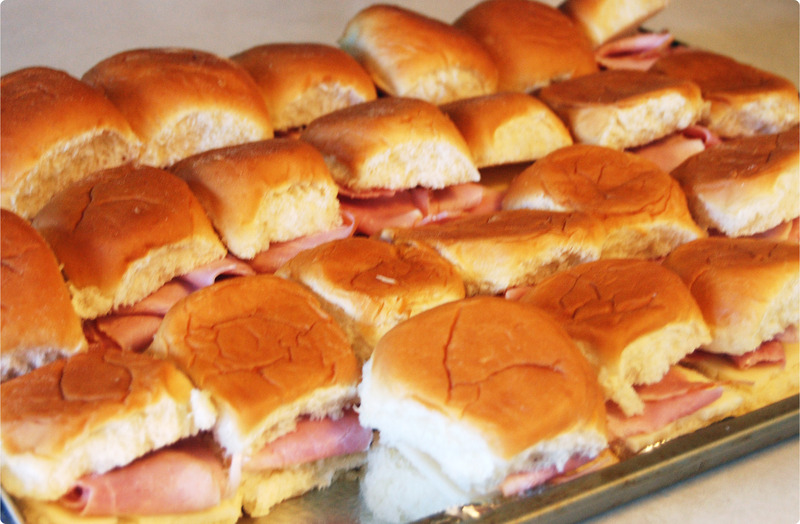 In a tournament of sandwiches, these would definitely make it to the final four. Line a rimmed baking sheet with aluminum foil. Spray with cooking spray. Slice the buns in half and place on baking sheet. 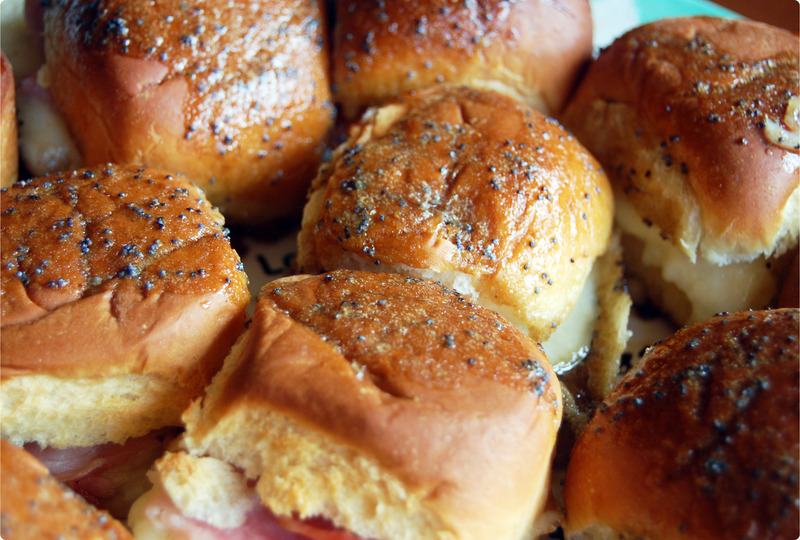 (I was able to squeeze all 24 on one baking sheet) Place one piece of ham and 1/3 slice of cheese (depending on the size) on each bun. In microwave or on stovetop, melt butter. Add brown sugar, Worchestire, mustard and poppy seeds. Spoon mixture over the top of each bun, coating with mixture. Allow to sit for 30-60 minutes – do not cover! Preheat oven to 350. Bake for 30 minutes. Serve warm. Like many of you, the new year always brings similar resolutions. Be healthy. Save money. This year I plan to share with you some of my belt and budget shrinking recipes to help you stay on track with your 2012 goals. 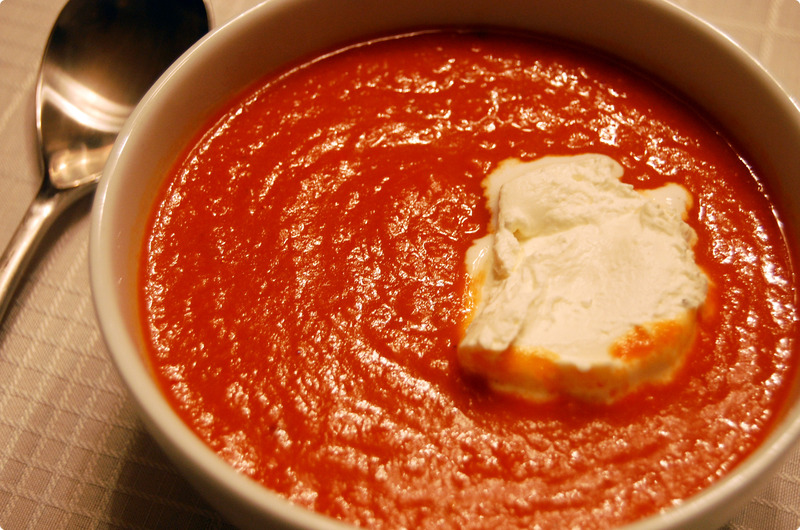 This tomato soup has been a staple in my household for some time. Made with pureed beans and carrots, it’s creamy without the calories. Best of all, you can make the entire batch of soup for less than $6. That is a $1 per person, take that McDonald’s dollar menu! In a large stock pot, heat olive oil. Add onions and cook until soft, 3-5 minutes. Add broth, carrots, beans, tomatoes, rosemary (leaving a tiny pinch behind), salt, pepper and red pepper. Bring to a boil, cook until carrots are softened, about 15 minutes. Using an immersion blender, throughly blend soup until thick and creamy. (If you do not have an immersion blender, transfer soup to blender or food processor in batches until all is smooth). In a cold metal bowl, whip heavy cream on high until light and fluffy, about 5 minutes. Slowly add pinch of rosemary and lemon juice until combined. Ladle soup into bowl, top with one teaspoon of whipped cream. The extra tablespoon of whipped topping is not necessary, but adding a real creamy texture to the soup. The extra tablespoon is worth the few extra calories in my book, but if you are really cutting down, leave it out. It is delicious either way!